"The Official Lake of the Ozarks Web Site". 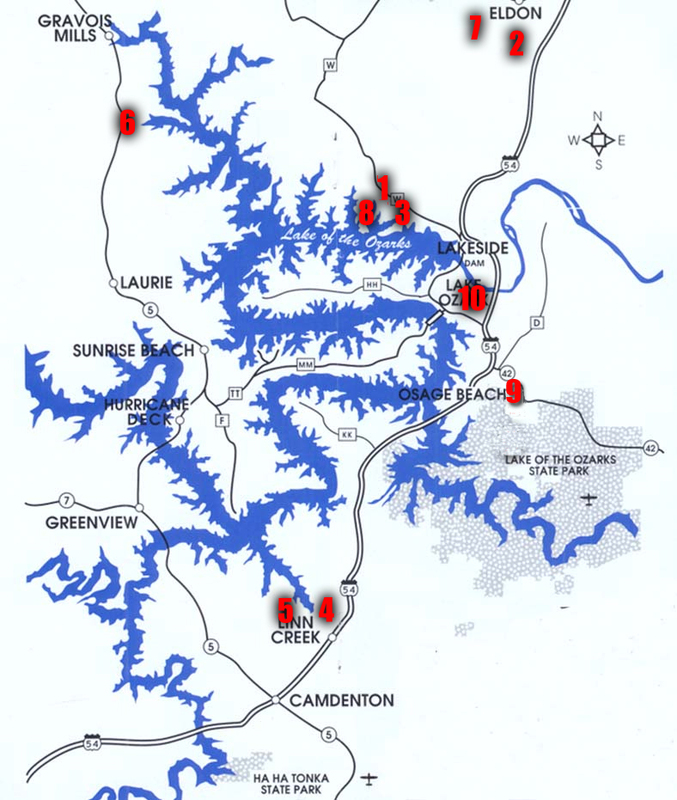 85 total sites, 10 pull thrus, 75 full hookups, 7 water/electric, 23 tent sites, 2 cabins, 20-30-50 Amps. Facilities: Swimming pool, dump station, Laundry, Playground, Restroom/Showers, Store, RV/Boat storage, Game room, Hiking/Nature trails, Pavilion, Shuffleboard courts. Other: Lake access nearby, Fire rings, Firewood, Picnic tables, Wi-Fi, Seasonal/Monthly rates, Groups welcome, Pets welcome, Large shady sites. Disc: Good Sam, SKP, FMCA, AAA. Located: On State Road "W"; 4-1/2 miles to park. Welcome to Lazy River RV Resort, a beautiful campground is located in Missouri, on the Osage River just minutes from the Lake of the Ozarks.Lazy River RV Resort serves as a great summer vacation destination. We have plenty do for the whole family. Everything from golfing to watersports to hiking, you'll find it all located within minutes of the campground.We're pleased to annouce that we're offering individual lots for purchase. That's right you can buy a lot and it's yours forever. Imagine being able to spend summer after summer on your own piece of property located in one of the premier destinations in the mid-west. With lots starting at $17,500 it's also a great real estate investment.Of course, if you just want to come and stay a couple nights or even weeks we offer that as well. The most unique campground at the Lake featuring 74 total sites, 50 full hookup, 20-30-50 amp, 7 pull thrus, 24 tent sites, 5 Treehouse cabins, 1 Shipwreck cabin, 2 Camper cabins, 1 Deluxe cabin, 1 Survivor Island rental. Facilities: Private Fishing Lake, Playground, Swimming Pool, Pavilion, Restrooms, Showers, Laundry, Store, Paddle Boats, Shuffleboard, Basketball, Volleyball, Horseshoes, Trails. Other: Firerings, Firewood, Picnic Tables, Modem & Pet Friendly, Groups & Reunions Welcome, Weekly, Monthly, Seasonal rates, Near All Major Attractions & Bagnell Dam. Lake Access nearby. Disc: Good Sam, AAA, Sr. Citizen. Located: From Business 54 at Bagnell Dam, take Hwy W 2 1/2 miles. Turn Right at Cross Creek sign follow road to campground. 65 Full sites with cable, 30-50 amps, daily-weekly-monthly, Group & family tent area, 1 bedroom furnished housekeeping units, Propane tanks and RV's filled 7 days a week, Laundry, Game Room, Playground, Hiking Trails, close to major attractions, 4 miles to Osage Beach. 45 total sites, 10 pull thrus, 20 full hookups, 5 water & electric, 20 tent sites, 20-30 Amps, condo rental. Facilities: dump station, Playground, Pavilion, Restroom/Showers, Laundry, Dock, ramp. Other: Pets welcome, Picnic tables, Level, Shady & grassy sites on water's edge, Lake access. Located: On Lake Road 54-69 in Linn Creek; turn at City Hall. Follow black top to campground. 32 total sites, 22 pull thrus, 32 full hookups, 2 cabins, 20-20-50- Amps. Facilities: Pavilion, Swimming pool, Hiking/Nature trails, Store, Laundry, Playground, Restrooms/Showers, RV/Boat storage, Dump station. Other: Picnic tables, Level sites, Groups welcome. Located: On Highway 5 at the corner of State Road "P". 4.5 miles north of Laurie & 2.5 Miles south of Gravois Mills. Beautiful primitive campground on the Osage River for Tent/campers. No RV hookups or dump stations. 1 Cabin with shower/Kitchenette, Water/Electric. Facilities: Restrooms/Showers, picnic tables, dock. Other: Pets welcome, Firewood, Seasonal/Monthly rates, Shady Sites. Located: 1 mile off Highway 54 on Cat Rock Drive between Lake Ozark and Eldon, turn left at the Fire Station and Storage unit. RV park located on the Lake of the Ozarks near Bagnel Dam. 52 full hookup sites with free basic cable, free Wi-Fi, 20-30-50 amp, Big rig friendly. Facilities: Swimming pool, beach, ski and pontoon boat rental, boat ramp, slip rental, restroom/showers, laundry, playground and large grass play area. Other: Horseshoes, picnic tables, fire rings and firewood. Located near all major attractions by land or water. Where you can be on the lake without leaving the campground. Located: From the north intersection of business 54 and Hwy 54 take Hwy W 2.7 miles north, left on W-20 (Village Marina Rd), take the first right (at Shorewood Landing sign), proceed 0.03 miles via gravel rd. to Lake and RV park.